Halloween is just around the corner! You have decided with a group of your friends to celebrate the spookiest time of year by entering a contest! The contest will take place at midnight, located in the winding woods by your house; you will only have the light of the campfire to protect yourself against the shadows of the night! As you sit around the campfire listening to your other friends’ frightful fictional tales, you debate which haunting story of your own your will tell that will spook them to a sleepless night. You have many frightening tales to tell but find it difficult to pick just one that will scare your friends the most. High 5 Casino is here to help you, with two adventures that are bound to do the unsettling trick. During one moonlit evening, in a town not unlike your own, the dead arose from their earthy graves to wreak havoc on the innocent residents. As their dearly departed, yet now reanimated loved ones walk the streets, ready to attacks, the living seeks for assistance. Unfortunately, help would not come to this once peaceful place. Labeling this town, the “Zombie Zone,” the government had it quarantined; neither the dead nor living can escape the wasteland that was once a beloved community. Faced with a fearful foe that craves “Brains!” a group of unlikely residents band together in hopes of survival. Will they survive this zombie apocalypse or fall to the terror of the Zombie Zone? In the town of Sleepy Hollow, a place filled with history and lingering ghosts, something stalks the night every year around this time. Legends say a man, without his head, rides through town seeking out another’s head to replace the one he has lost. Dubbed the “Haunted Horsemen,” many believe he is responsible for the disappearance of beloved locals who strayed out into the night, never to be seen again. The disappearances have the townsfolk worried, so they call in a specialist to help them solve this macabre mystery. One brave soul will search the darkness to discover the horrible truth; however, he might just be in over his head. 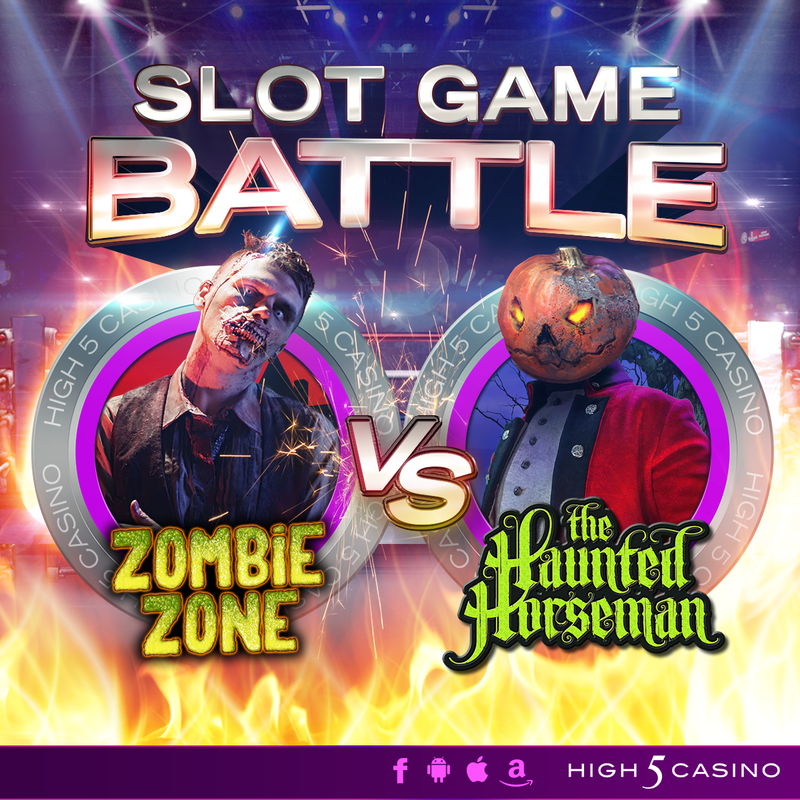 Will he be victorious, or another causality of the Haunted Horseman? Which tale do you believe will fill your friends with fright? Which story gives you the chills? Can you outlast a zombie outbreak or fight a demonic equestrian? Comment in the conversation bubble located on the top right corner of your screen and let us know! This entry was posted in High 5 Casino, High 5 Games, High 5 Moments, Slot Game Battle, top games and tagged Android, App Store, Facebook, Free Games, game preview, Game Spotlight, High 5 Casino, High 5 Games, High Limit games, iOS, iPad, iPads, iPhone, iPhones, Shake the Sky Casino, slots, social gaming by hoothigh5. Bookmark the permalink.